Once upon a time I thought I could make all sorts of gifts, stock my etsy shop and a few local shops. I keep trying, but the idea is becoming more of a fantasy as time goes on. 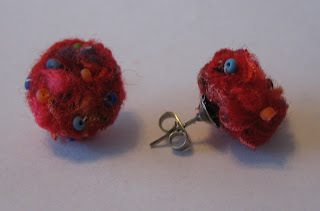 Here we have earring experiment #1: Adorable balls of confetti, felted wool that's been beaded. The problem? I don't know how to attach them to an earring post. Perhaps I need to find ones that can be stitched on. Notice the glue stuck all over the side of one of them? Yuck. Back to the drawing board on these. Next, we have earring #2. I like these. Felted sweater circle beaded and attached by wires. The problem? I wish the wire had been longer for me to wrap them a bit more. Knitty's "Fetching" fingerless gloves - love these! Wrapped and gifted already. More wool confetti to craft into something. I really like the circle ideas, maybe I'll just continue with that and trim these up a bit and go pick up some more wire tomorrow. Just got a phone call from shop #1. I'm in the newspaper!!! (I thought it was coming out Thursday). Tomorrow I'll deliver some more felted bowls and see how things are going over there. She also told me she's moving her shop and will be having lots of sales right after Christmas, so the rest of my items will go to shop #2 and etsy. It actually feels like a little pressure has been lifted off my shoulders. I really enjoy crafting and making some of my ideas a reality - I just wish I could concentrate and do it more regularly, not in these mad rushes when I have 100 things to do at the same time.